The Six Californias ballot initiative is not the pipe dream of some secessionist Siskiyou County constable. This intriguing proposal, recently cleared to gather signatures, would subdivide the Golden State into six more sensibly sized political jurisdictions, each with its own capital, legislature and, notably, pair of U.S. Senators. Just think: A one-hour drive would deliver any voter to the state capitol. The thrust of the idea is that the Alturas-based cowpoke shares few, if any, of the environmental or social sensitivities of the 900-mile-distant Santa Monica Prius driver — and neither harbors any special affinity for the Bakersfieldian. 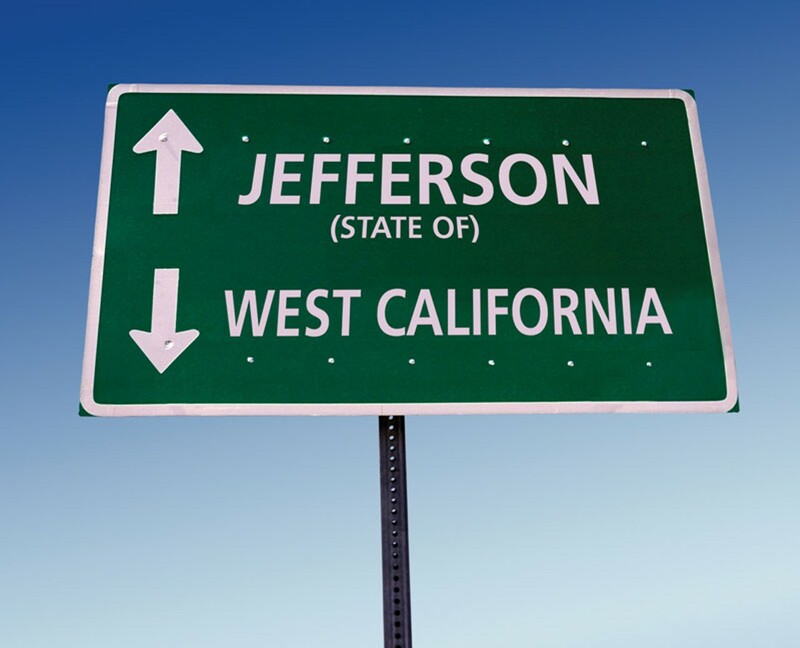 If adopted this November, Los Angeles would be rebranded West California and we northerners would join 13 other top-of-state counties to form the State of Jefferson, with Redding — or possibly Eureka — becoming its likely capitol. Humboldt County Supervisor Rex Bohn believes the State of Jefferson, under the Six Californias proposal, would become an impoverished %&*@-hole, though he put it a bit more delicately. 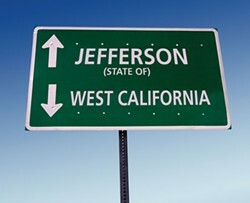 He's got a point: A recent study out of Sacramento suggests that Jefferson's GDP would hover somewhere around that of Mississippi. Of course, what Rex and the beard-scratchers in Sacramento overlook is all of the money we Northerners stand to make by holding our water ransom, and selling timber once unbound by environmental restrictions promulgated by control-freak Angelenos. But a more-localized capitol would result in still other savings: A plane ticket from the Eureka/Arcata Airport to visit the existing state capitol, Sacramento, sets us northerners back a prohibitive $750. Individuals residing in Los Angeles — which siphons 95 percent of the money out of Sacramento to build eight-lane freeways and suburban blight — fly to the state capitol for $154. That's an 80 percent discount. Before you go rushing to Google Maps, the answer is: Arcata to Sacto, 199 air miles; L.A. to Sacto, 373 air miles. That's right: We pay 80 percent more for the privilege of traveling 174 fewer miles. What this means is that for the price you pay to jump on a Sacramento-bound plane to protest GMO Frankenfoods, the Angeleno brings himself and his four buddies from the Monsanto distributorship. Thus, not only do the more-distant Southlanders vastly outnumber us in sheer quantity of voters, but Dodgers fans enjoy cut-rate, express-lane access to the corridors of influence. When Mozilla, Inc. CEO Brendan Eich was sacked last month over a political contribution he made to California's Proposition 8, Eich became the most prominent — but hardly the first — executive asked to clean out his desk over support for the anti-gay-marriage initiative. Beating Eich to the Prop. 8 unemployment line were the likes of Scott Eckern, who was relieved of his duties as Artistic Director of the California Musical Theater, a major Sacramento non-profit. Within days of its publication on the Internet, the $1,000 check Eckern gave to Prop. 8 coffers rendered him suddenly unfit for employment. The Director of the Los Angeles Film Festival, Richard Raddon, was likewise hounded out of office after financial disclosures revealed that Raddon spent $1,500 backing the measure. What Eich, Eckern and Raddon have in common — besides being on the receiving end of torches and pitchforks — is that their contributions were, as dictated by law, posted to a name-searchable webpage. A consolation? As evidenced by local reaction, gainful employment on the North Coast is practically guaranteed to these, and other, Prop. 8 refugees. Alliance with Prop. 8 in Redwood Country, it seems, equates to robust job security. The Web tells all: The same search page that befell Mozilla's geek-in-chief reveals a chamber of commerce-worthy cadre of prominent Eureka-area businesspersons, whose Prop. 8 backing hasn't caused a ripple. Appointed government servants, too, are present — some in high places — with personal donations in support of Prop. 8 that far eclipsed Eich's $1,000. It seems counterintuitive in this liberal neck of the woods — complete with a university and well-permeated "grow" culture — but could a lack of tolerance be the solution to Humboldt's higher-than-average unemployment rate? Hooray! A wet spring has filled Ruth Lake and the drought is over. Mind you, the drought continues in parched SoCal. The desert dwellers in greater Palm Springs — with only 5 inches of annual rainfall — must be facing the prospect of brown golf courses, right? Riiiight. Turns out Palm Springers are laughing at us as they hose down the driveway and wash the Jag. Get this: Although we would-be Jeffersonians are net water exporters, our own wet stuff flows less expensively out of Droughtville faucets. You'd think 40-inches of yearly rainfall and a backyard better known as "Six Rivers National Forest" would cut us a break on the water bill, but you'd be mistaken. Happy customers of the Desert Water Agency, which services Palm Springs, pay $1.29 for the same per-unit volume of water that Eurekans pay $1.88 for. And lest you attribute the Victorian Village's ugly water rates to hook-up fees, wrong again: A one-inch meter comes online down in the desert for $10. In Eureka, it's $55. Philadelphia police recently flipped a hilarious, Brat Pack-worthy drug ring consisting of white preppy high school kids pushing skunk weed delivered to the Keystone State from — you guessed it — California. Marijuana, following the law of supply and demand, must now travel from the glutted Emerald Triangle to the Eastern Time zone in order to clear a modest profit. Here, the stuff essentially has become parsley: Hastily trimmed remnants were recently fished out of Eureka's Hawthorn Street landfill, buds still attached. And no self-respecting Arcatan would actually purchase a joint. The $420,000 question is how decriminalization would impact the tri-county Emerald Triangle. Pot's white-market emergence has long been touted as the secret sauce that would transform Humboldt into a 420-style Napa — enriching craft-growers while diminishing our need for fabric softener, turkey bags and a whole lot of cross-country postage. Spoiler alert: Subjected to the same government regulation as water, an ounce of Garberville's finest will be cheaper in Huntington Beach than Redway.